Go to my blog's tag "disaster" for coping ideas. Disasters aren't solved quickly. My blog's disaster series included ideas from storytellers and others who survived disaster. A year later I still hadn't completed all insurance paperwork. Less than a year before our houseflood we met with our insurance agent and were told we had over 100% coverage. . . yeahrightsure, but at depreciated value! He apologized for the oversight, but without replacement coverage books and stored clothing filling pages of forms were depressing reminders of what was lost and "worth" replacing. He no longer writes policies for less than replacement value, but our houseflood alerted him to that oversight. Why tell this? It's my personal story of a fairly manageable disaster. I remember a Toledo librarian whose library burned down. She later said if she'd known how things would go afterwards, she'd have thrown the books on the fire herself! We had great help from ServPro, who did an excellent job of removing water and then removing the remaining moisture, and Above Board Construction did a great job of giving us new floors, walls, and electricity. (Note to self: go to business reviewing sites to review them for how wonderful they were.) The process of all this seemed to take forever and some things just can't be replaced no matter how good your "insurance." With the numbers affected by Sandy there will be a shortage of ServPros and "above board" construction, just as restoring power and heat was slow. Libraries already cope with reduced budgets. Some public libraries here in Michigan are closing or barely open. That's why the Geek the Library campaign was started. Individuals without heat and power found any libraries open a source of both power and information. Unfortunately Superstorm Sandy damaged some libraries badly enough to require major reconstruction before they can reopen in the very areas most in need of their help. 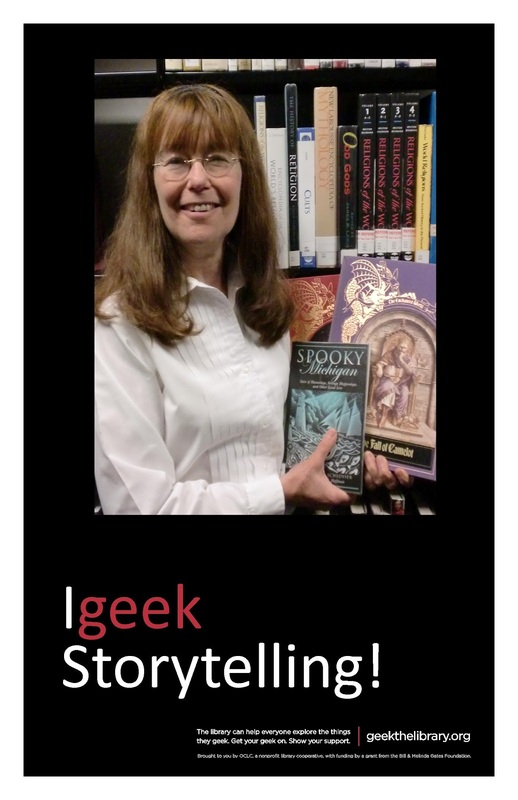 Whether the word "geek" deserves to become a verb or not, libraries still have enormous value for their communities. Much of my research for my storytelling and, yes, a lot of it is online, uses the skills librarians offer daily. (I sub occasionally at White Lake Township Library as I wasn't ready to walk away from those skills and helping people. With help from congregation member, Beth Rosin, I'm also in the midst of putting the roughly 3000 items in our church library online.) Even when the power goes out on our electronic "toys", the value of libraries remains. In this time when we look forward to giving thanks, let's be thankful in supporting our libraries.